Hezbolah, Lebanon's Iran- and Syria-backed guerilla organization that became a key player in the Beirut govermnent, has amassed some 40,000 missiles, the French daily Le Figaro reported Monday, saying that Damascus had a major role in replenishing the group's arsenal after its 2006 war with Israel. The report also shed new light on the structure of Hezbollah's military wing. Le Figaro cited the United States as having observed that alliance in January, when its radar spotted 26 missiles M-6002 in the area between Damascus and Syria's border with Lebanon. According to Le Figaro, Hezbollah has to date more than 10,000 fighters, and that its weapons transport system is divided into three units: Unit 108 is responsible for transferring weapons and ammunition from Damascus to Hezbollah bases on the Lebanon border and near the Syrian airport; next comes Unit 112, which transports the weapons from those bases into Lebanon; third is Unit 100, which deals with deployment and training. Satellite photos taken in March of last year and caught earlier this month show that the Syrian army has a Scud missile base near Damascus. 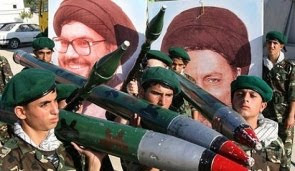 While the images also suggest that Hezbollah activists are being trained in the Scuds' use at the base, Syria denies reports that it has supplied the militant group with those weapons. The photos can be seen by any web surfer on Google Earth. They show extensive construction at several military bases throughout Syria, including at one of the country's three largest missile bases, located 25 kilometers northeast of Damascus, near the city of Adra. Uiteraard is deze constructie en wapensmokkel geen onderwerp voor de krantenkolommen en het journaal, want daar is men te druk met het veroordelen van de bouw in de nederzettingen. De illegale wapensmokkel naar Hezbollah is toch zeker ook een obstakel voor vrede, het is in strijd met VN resolutie 1701, en het destabiliseert Libanon en mogelijk de regio. Hallo journalisten, waarom is het hierover weer zo stil? Had het nieuws hier geen aandacht aan kunnen besteden in plaats van het non-nieuws dat Netanjahoe de soldaten prees die de Mavi Marmara enterden in mei?